SB&H needed their website redesigned and redeveloped with improved editing features - as experts in this field we were called upon to assist. Intrigue responded with a completely overhauled system including a Drupal CMS to facilitate easy staff updating and an overhauled web design that makes it easy for visitors to find content. The site is search engine friendly, simple to use, and features a market place that allows related vendors to advertise their products - this feature creates much needed revenue for SB&H. The updated site has been extremely well received - the design is fantastic and staff love the simple interface; keeping the site updated weekly as a result. Want to see more? 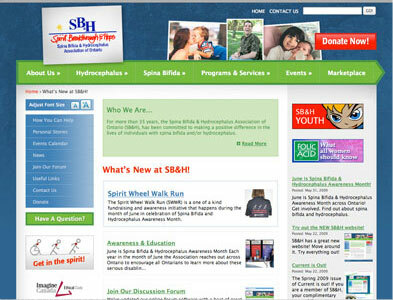 Take a moment to visit their site at www.sbhao.on.ca.